I love a good pun. And something that I love even more than good puns are slimy green creatures with bad teeth that stick their heads up out of toilets. So, naturally it was a win-win situation for me when I first gazed upon the poster for Ghoulies back in 1985. Take a good look at that beauty of a poster……because the actual movie is pretty awful so the poster is really all that we have going for us unfortunately. Yes, Ghoulies as a film is not good. But dammit if those involved with the marketing knocked it out of the park, because the poster and cover art for the VHS lured people into watching this crap. Sure, it’s an 80’s guilty pleasure to some and uncomfortable toilet paper to others – but you can’t deny the sheer genius of the tagline ‘They’ll Get You In The End!” along with the image of that green Ghoulie coming out of the crapper. 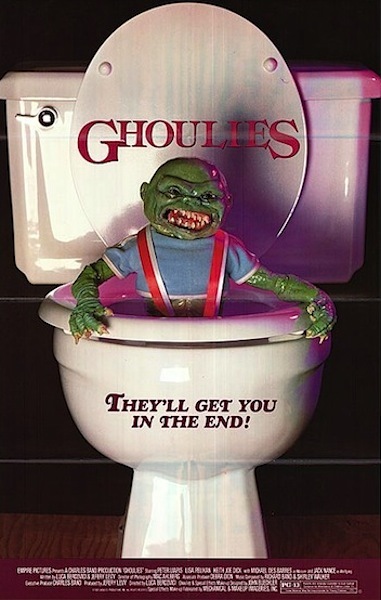 Speaking of crap and crappers, they rode that toilet theme all the way to Ghoulies III: Ghoulies Go To College. That’s right….they actually went to college.